Do you long for the days of neon, leg warmers and big hair? Click here to play! Well, travel back in time to rock out to your favorite cassettes while playing Space Invaders. And while you're reliving the glory days you could win a bunch of cash! If you really want to get back to the 80s, you'll have to spin the Atari symbol. Two to five of these across a pay line will get you up to 5000 coins. It also acts as a wild symbol and will triple prizes when it appears in winning lines. The neon smiley is another symbol that will get you reminiscing. Spin this jackpot symbol and you could get up to 800 coins. Radical dudes and big haired dudettes will also bring in some decent dough, each scoring up to 750 coins. Three to five boom boxes will get you up to 200 coins and three to five leg warmers will get you 100 coins. No trip back to the glorious era that was the 80s would be complete without a little break dancing. 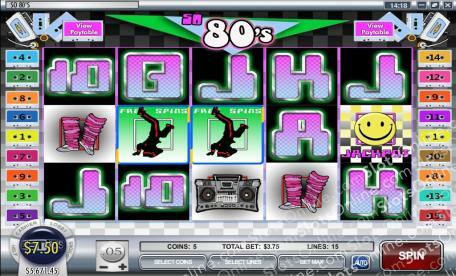 Spin three to five break-dancers to trigger a number of free spins. So rat your hair and pull on the spandex for a chance to win big in the 80s. The totally awesome break-dancer acts as a scatter. Spin two to five of him on an active pay line and you could get up to 75 coins. Spin three or more and you'll trigger 10 free spins in which prizes are tripled. The Atari symbol acts as a wild. Two to five will get you up to 5000 coins. It will also replace other symbols, excluding scatters, to help create more winning combinations. It will triple prize money when it appears in a winning line.